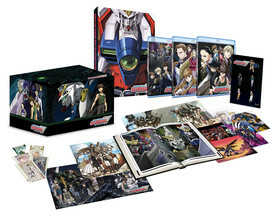 Mobile Suit Gundam Wing Collector's Ultra Edition contains Episodes 1-49, Operation Meteor OVA (Japanese Audio) and Endless Waltz OVA + Movie (Japanese/English Audio) housed in a high-quality chipboard art box. This Ultra Edition also includes 5 large art cards, 5 small art cards, 3 posters, 5-piece metal pin set, and a 180 page hardbound art book featuring pages of amazingly detailed key art, promotional artwork, mecha and character design galleries, staff and cast interviews, storyboards, and more! Mankind has moved into space. Thousands of people live on giant orbiting space colonies called "Sides." However, the Earth Government, which rules the colonies, is unjust and cruel. A group of revolutionaries build five robotic weapons called Gundams and plan to send them to Earth to begin their fight for independence. Piloted by five young men, these Gundams carry the colonists' hopes and dreams of freedom with them as they descend to Earth to begin Operation Meteor! Special Features: Disc full of exclusive extras including the New Mobile Report Gundam Wing: Frozen Teardrop Picture Drama and cast interviews.